The numbers revealed: Groupon, MyDeal, LivingSocial and more! 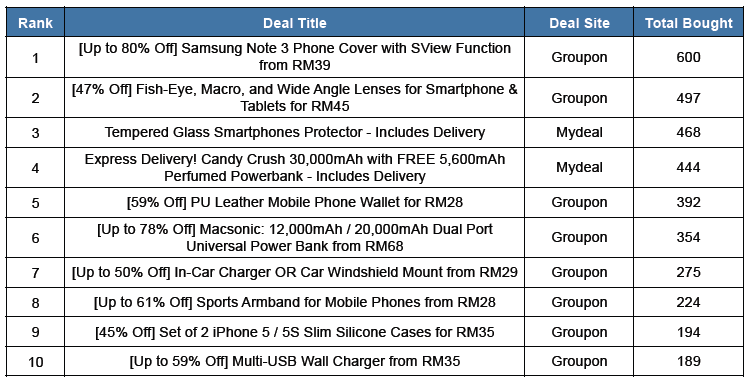 According to All Deals Leak who provides group buy data in the region, Groupon, MyDeal and LivingSocial are the top 3 deal sites in Malaysia in terms of revenue. 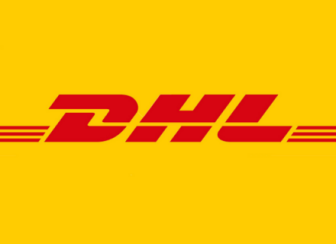 Post AirAsia, deal sites madness since 2011 is the biggest thing that happens to e-commerce landscape in Malaysia. There were more than 100 clones during one time but most went into deadpool. If you refer to our online shopping infographic which we published in January 2014, 3 out of the 5 top online shopping destinations are deal sites, namely Groupon, LivingSocial and MyDeal. 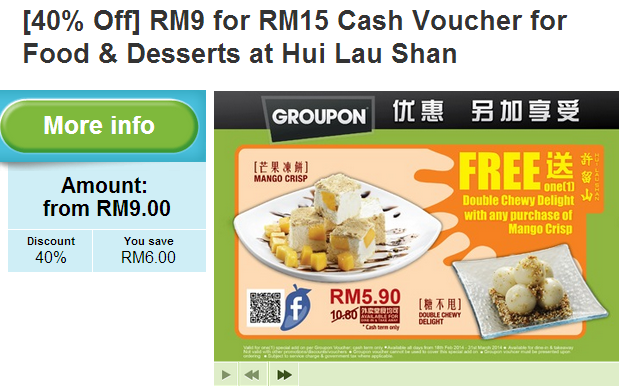 Groupon was the market leader by far with around RM 11 million sales from revenue generating deals. In January 2014, the nearest competitors to Groupon were MyDeal and LivingSocial at close to RM 2 million sales respectively. Do take note MilkADeal, Deal Hunt, Ezivoucher, and I Love Discounts are not included in the analysis here as information about their total revenue are not available. In terms of coupons sold, you can imagine that there were more than 200,000 coupons sold via Groupon in January. 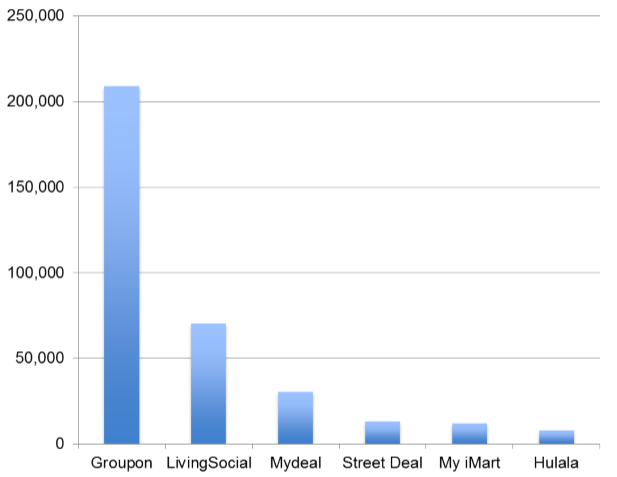 LivingSocial performs better than MyDeal in this area with about 70,000 coupons sold. 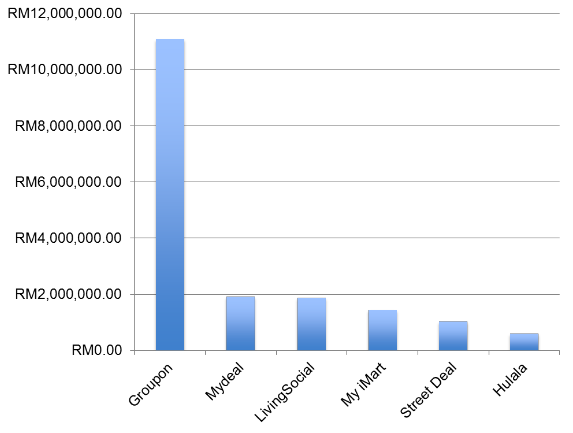 From the January's dataset, the average coupon amount sold by Groupon was RM50+. Even though LivingSocial performs better than MyDeal in this area but the average order volume is significant lower than MyDeal and Groupon. Most of the deals sites are selling more Products lately and in overall, 55.82% of all deals are Products with the rest lean towards services. The total revenue generated by Products via deal sites was more than RM 6 million in February (it was more than RM 8 million in January 2014). However, Food & Drinks with much lesser deals offered (compared to Products) have gathered the most coupons sold among the categories. The average coupon amount sold for Food & Drinks was of course, much lower than Products. It is also interesting to find out that Entertainment & Recreation is the most rewarding category for deal sites as in average revenue per deal. Since Products category generates the most revenue, let's take a closer look here. MilkADeal, MyDeal and Hulala offered the most number of Product deals but unfortunately, we don't have any revenue data to refer on MilkADeal and Hulala here. Groupon as expected, delivered the most revenue via Products, leading the rest of the players by far. In fact, Groupon is the market leader in every categories by a margin. For example, Samsung Note 3 Phone Cover was the most sellable IT Accessories deal in February, while 4-USB Port AC Adaptor was the most popular one in January 2014. In fact, we have witnessed that 5 out of the top 10 IT Accessories deals were powerbank back in January, but only 2 powerbanks broke into top 10 in February 2014. Moral of the story: If you are an online merchant, you might want to "sniff" the product demand, market and consumer trend to sell even more online. Last but not least, bring on the #1 deal in February in terms of revenue generated and number of coupons sold. 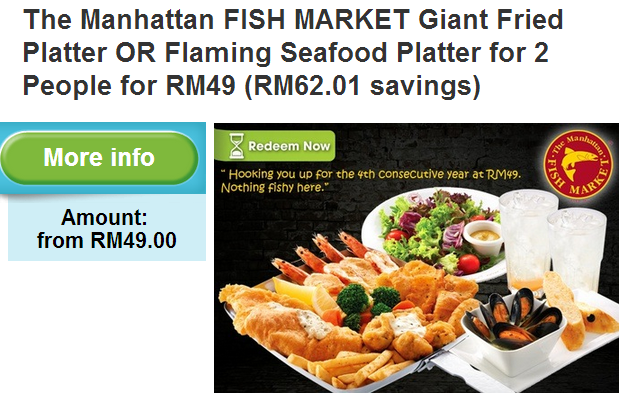 The Manhattan Fish Market deal above has single-handedly raked in RM 754,600 for Groupon last month (with 15,400 coupons sold). Another deal by Hui Lau Shan below has sold even more coupons last month, with a total of 16,483 bought. In fact, ALL Deals Leak provides much more in-depth data (breakdown by every categories) than what have been presented in this article. You can subscribe to their monthly paid report to understand more about what kind of deals are in demand locally. This will definitely support your sourcing, merchandising and promotions strategy as an online merchant. ecInsider: The numbers revealed: Groupon, MyDeal, LivingSocial and more!